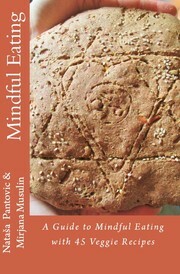 Are you sure you want to remove A Guide to Mindful Eating from your list? We can use food to help us recover from Stress and Disease. Not taking food seriously will eventually lead to Stress or/and Disease. Lot of us have problems with over-eating, eating too often, eating too little, eating junk food, food allergies, etc. A Guide to Mindful Eating is designed to empower you in your relationship to food, helping you become more aware and conscious of the body / mind connection to food. We have also prepared for you 45 delicious and healthy veggie recipes to help you build a healthy and nutritious diet. added by Nataša Pantović Nuit. "Conscious Eating a big step towards Conscious Living"
Lot of us have problems with over-eating, eating too often, eating too little, eating junk food, food allergies, etc. This Guide the Conscious Eating is designed is such a way to empower you in your relationship to food, helping you become more aware and conscious of your body / mind connection to food. added by Nataša Pantović Nuit. "Mindful Eating and Overeating"
June 24, 2017 Edited by Nataša Pantović Nuit Edited without comment. May 22, 2016 Edited by Nataša Pantović Nuit Edited without comment. April 7, 2015 Created by Nataša Pantović Nuit Added new book.